They call it “spatial mismatch” — when people are separated from job opportunities by long commutes, poor transit connections, or other geographic obstacles. How places contribute to, or thwart, economic opportunity is an increasingly hot topic, but still not entirely understood. 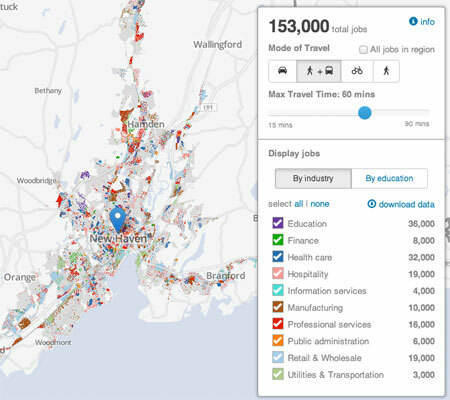 The interactive tool also allows you to look at where you can get to by car, public transportation, or bike, not to mention filter by travel time, desired industry, and worker education level. The issue of metropolitan opportunity, which is highlighted in these maps, has an enormous impact on our economy, housing, well-being, and ability to be a sustainable and resilient city. Looking at the map, it is easy to see the importance of our transportation infrastructure and land use, and how it relates to issues of affordability (transportation is generally the second-largest household expense, after housing). In New Haven, the issue is particularly important, with New Haven Mayor Toni Harp emphasizing repeatedly that transportation is a civil rights issue. The largest-ever survey of our region, the Fall 2012 DataHaven Wellbeing Survey found that many families with children earning less than $50,000 per year did not have regular access to a car, while virtually all of those earning more than $50,000 per year did. Residents who rely on transit were much more likely to feel that the job market is poor. Elsewhere on the Network today: Rick Bernardi at the Bicycle Law blog remarks on the shocking reliability of the old get-out-of-jail-free card for drivers who kill cyclists: “I didn’t see her.” And PubliCola explains a new proposal to shore up Seattle Transit after this week’s electoral defeat.